Are you a novice to family history? Our Branch members are very knowledgeable and eager when it comes to searching for elusive genealogical records. 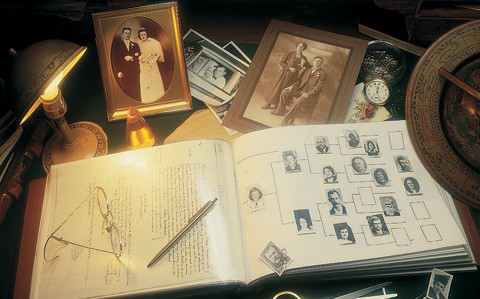 These resources are invaluable to any successful family history project. With more and more records becoming digitized and accessible on the Internet, the new researcher may need help in finding relevant information. The Grande Prairie Branch can provide a Genie volunteer to mentor you through the basic steps of genealogy. We assist with advice on proper techniques and offer several strategies for success. Our service does not include conducting research on your behalf. "Genies in the Library" is a service offered by the Grande Prairie Branch. It started in 1996 on the recommendation of Barb Moreau, a staff member for the Grande Prairie Public Library who saw the idea in a newsletter. This service has run continually ever since. With the buzz of voices, faces focused to laptop screens surrounded by stacks of reference material... is the scene on Genie night. For assistance with the Genies join us in the Isabel Campbell Room located at the Grande Prairie Public Library on the 2nd and 4th Wednesday of the month from 2:00 to 9:00 pm. Contact the Grande Prairie Branch at gp@abgenealogy.ca or phone the library at (780) 532-3580. We recommend emailing or phoning to set up an appointment. A recommended primer for beginner genealogists Planning is Your Friend › is available on the AGS website. To prepare yourself for the meeting, learn about the two most common forms used by genealogists to record ancestral information: the pedigree chart and family group sheet at this website Genealogical Forms ›. Bring the forms and your questions with you. We love to help!